Home » Atlanta » Marvel Heroes Come in All Sizes! The first thing Christopher Butler will tell you if you’re lucky enough to meet him in person is how fortunate he considers himself to be after spending the lion’s share of his 45 years helping people in need. “I’ve had an incredible life,” Butler says through his signature thin brimmed glasses and distinctive tenor voice. “Finding ways to help people truly means everything to me.” Even though that annoying little distraction called “work” initially hindered his ability to help those in need, he ultimately was able to unite his personal and professional interests with a successful career with the City of East Point Fire Department, located in the metro Atlanta area. I had the honor of working with Christopher for two years. He was one of the first crew members I met for my first day of work after graduating from the fire academy. I still recall my very first day on shift and the advice he gave me. He pulled me aside and simply stated, “Everything you do in this job is for the benefit of the citizens. If you always put them first, you will always succeed.” That simple statement was reminiscent of the Marvel comic books I read as a young man and reminded me that the best way to measure a hero is by the size of their heart and their true intentions. The most fascinating thing for me is that over the years Marvel has beautifully created a hero for everyone. Whether you are big like Hulk, small like Ant-Man, a young male, a teenage female, in a wheelchair, a casual adult fan, or a diehard collector, heroes come in all sizes and that diversity is what makes them so powerful and relevant today. Christopher is a quiet hero. He has a huge heart and is subtle in his ways to help and support people, whether it is passing along additional resources to family in need or spending extra time to speak with a young child after a difficult medical call. 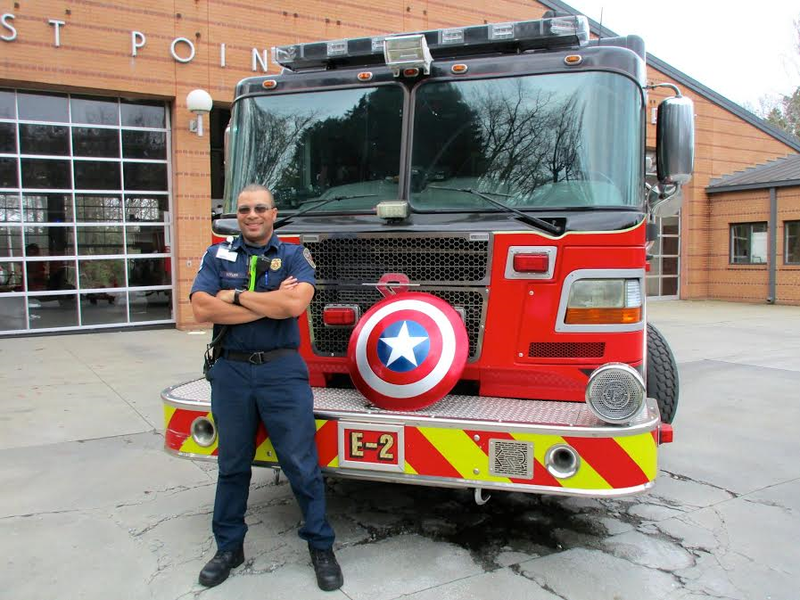 He has adoring fans throughout the City of East Point, serves on countless local committees and has even won the city’s prestigious Firefighter of the Year award. Yet he doesn’t consider himself a hero. “I just do my job the very best I can.” he says. When asked about defining moments in his life, being a proud father of six children comes to mind first, but he is reminded and still deeply troubled from an incident that happened while he was watching his old high school football team play a few years ago. With a genuine desire to help and a small loan, Christopher created HiddenGems 411, a recruiting company that helps high school student athletes secure athletic scholarships to colleges. Christopher knew exactly what college coaches were looking for. He played football in high school in Atlanta and received multiple scholarship offers to smaller Division I and Division II schools. Coaches in the area knew him as well, so naturally the initial recruiting efforts started locally. Within a month, three high school athletes signed up for his services and within a year, numerous high school students in the Atlanta area secured scholarships to continue their education and athletic career at the collegiate level. His first cohort of student athletes are expected to graduate college in two years. “Yes. Yes. I’m just so excited to see them walk across that stage.” He grins. “To have a small role in their future success means the world to me”. I saw the jovial smile on his face quickly transform to a man who had serious and potentially lifesaving work to do. Christopher quickly and calmly climbed into the driver’s seat of Engine 2 and brought the 40,000-pound Fire Engine named INFERNO to life. As the smell of diesel fumes became stronger and the 550 horsepower engine anxiously idled, the rest of the crew loaded on, secured their safety straps, and the last thing I could hear was the distinctive wail of the sirens as they blasted out the station and out of sight. Today, this wasn’t my fire to fight. As I left the station to drive home, I began to think about how Firefighters are often thought of as superheroes, bravely rushing into a dangerous situation to help others while putting their own safety on the line. However, most firefighters don’t consider themselves superheroes. For us, saving lives, property, and protecting the environment is simply part of the job. I’ve read more than my fair share of Marvel comic books over the years and am unsure if there is a solid definition that encompasses every Super Hero you may see or read about. However, a common theme is that I’ve noticed is that a Super Hero must have the flexibility to make an impact in the areas and in the underserved communities that are important to them. A superhero rises above their basic instincts to help entire groups of people, not just a few select individuals. They don’t simply save lives, but also give hope to future generations. Now it’s your turn to nominate someone in for Marvel’s #WhoIsYourHero contest! Simply use the hashtag #WhoIsYourHero and nominate people you know who stand out as Heroes in their community. Some of the nominees will be randomly selected to win some great prizes from Marvel. Disclosure: I have partnered with Life of Dad and Marvel for this campaign, but my opinions are my own. 1 Comment on Marvel Heroes Come in All Sizes! That’s my brother! What a wonderful story Chris, I’m so proud of you for all of your accomplishments. Keep up the good work. Love you baby brother.